I’ve been in Tasmania for five years and this was my first trip to Bruny Island. Worth it. Think sandy beaches, rugged coasts, dolphins and seals! It was heaps of fun to meet other instagrammers and feel like a tourist in my own town. Last month, Destination Southern Tasmania organised an Instagram meetup on Bruny Island. Even schmos like me who don’t have 15K Instagram followers got to attend. There was an interesting mix of people — tourism operators, amateur and pro photographers, Instagram Famous Miles Gray and a bunch of us casual users along for the ride. I didn’t know a soul when I turned up at the dock, so it was well worth it to meet people throughout the day. We piled onto a bus early that morning and left Hobart for Kettering, where the ferry departs for Bruny. The day’s activities were facilitated by Pennicott Wilderness Journeys, who had their schedule down to a tee. It was a gorgeous, promising morning as we arrived into the sheltered inlet. Bruny Island is named for the French explorer Bruni d’Entrecasteaux, but its traditional name was Lunawanna Allonah. It’s 90 km long — about the size of Singapore but with 0.1% of the population, or so I was told. As you head south from the northern end of Bruny Island, the landscape changes from open paddocks to steep, forested hills. The largest salmon producer in the country, Tassal, is based here, as is the SBS series Gourmet Farmer. We passed cherry farms, sheep farms, oyster farms, the Bruny Island Cheese Co and numerous other small operations on our way south. We stopped at The Neck, a long sandy isthmus that connects the northern and southern halves of the island. A boardwalk to the top brings you to the Truganini Lookout, named for Truganini, a Palawa woman who was the daughter of the island’s chief and also one of the last known full-blooded Indigenous Tasmanians. The brutal colonialist history of Tasmania makes for depressing reading, just FYI. Today in 100% True Facts: The lookout at The Neck requires 15,000 steps to climb it. Okay, maybe not that many… but a few. Gotta get that 📸 ! After a short hike up the boardwalk steps, you’re granted a spectacular view of The Neck and its adjacent beaches. I had to force myself to keep moving and not take shots at every single step. Getting into the #selfie spirit. I brought sunnies, a light jacket and boots because, well, Tasmania. To the west, the quiet D’Entrecasteaux Channel. To the east, Adventure Bay. There are colonies of fairy penguins that you can see at dusk, if you’re quiet and respectful about it. I enjoyed watching the colony of photographers. We had lunch at the Adventure Bay Cafe and then it was time for the main event: a three-hour Bruny Island cruise! The word “cruise” implies a gentle, sunny ride — this was neither. It was fantastic. We were in confident hands with Mick, the skipper of our fast little boat. He cracked dad jokes and gave us the tour of the southern coasts of Bruny, all the way down to the tip where Tasmania meets the Southern Ocean. Dolerite is a dense, ancient stone that is commonly found throughout Tasmania, and it’s the reason why road engineers don’t bother with tunnels. These sea cliffs, at 273m high, are some of the highest in the Southern Hemisphere. We saw a number of caves that had worn away, as well as The Monument, a single great stone column left standing. Going right up to the faces of these formations was awe-inspiring. The geology shifted from dolerite to soft sandstone headlands, and the vegetation changed as well — less forested, more windblown. It looks pretty desolate to humans, but the local wildlife couldn’t be happier. I learned about the various wildlife colonies that can be found this way: right whales, abalone, sea birds, more fairy penguins, even an isolated population of albino Bennett’s wallabies in the hills. There are giant kelp gardens under the surface full of seadragons and trevalla. Very cool. The sea got rougher the further south we went, which made for an exhilarating ride — the skipper would crank the throttle and we’d all brace ourselves. I LOVED IT. We’d all shout when landing after a particularly large wave. I felt an intense camaraderie with the 40 other strangers on this boat. We were all given these giant canvas ponchos as we boarded, which proved their value when huge waves crashed over the side. If you did bring a camera, you’d want a place to stash it. The stars of our cruise were the pod of dolphins that swam nearby for a while, as well as these guys. Look at all those seals! These adorably doofy puppy dogs of the sea were unfazed by a boat full of people gawking at them. They were sunning themselves! Life was A-OK.
People got some great shots of the seals. I was really, really missing my camera. We arrived at The Friars, three miniature islands that mark the transition into the Southern Ocean. There might have been 2,500km of nothing between us and Antarctica but it began to feel a lot closer than that! I had on a jacket, but a beanie and gloves wouldn’t go astray in colder weather. We headed back to Adventure Bay and had coffee before returning to Hobart. If you’re Tasmanian, you wouldn’t think Bruny Island doesn’t need much of a push, tourism-wise. It’s a well-known spot for visitors with some of the nicest holiday homes in the state. These people who own a beautiful off-the-grid holiday home, 30 hours away from their real home in New York, are based here. Due to the ferry service, it will always remain secluded. Bruny Island is so calm and pretty, though. You can easily imagine having a quiet little seaside home of your own. And I never realised how awesome the Pennicott ‘yellow boat’ trips are — you won’t have to twist my arm to get a glowing review from me. Thanks again to Destination Southern Tasmania for organising this event, and a hello to all the cool Instagram people I got to meet! Go back, I want pictures of fairy penguins! Haha! 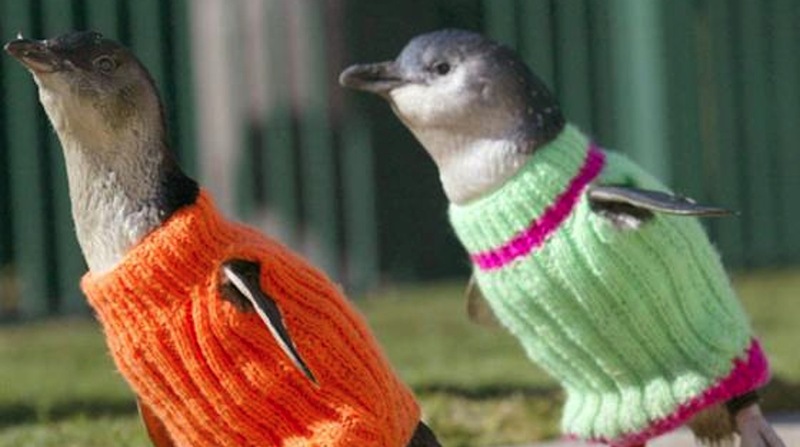 No photos I take will ever top this photo of fairy penguins in little sweaters. Sweet. I think I like the orange sweater best.